There are few things I look forward to in the summer more than iced coffee. One of my favorite ways to kick off a weekend is go for a decently long run (at least five miles) and then hit up a good coffee shop for a large iced coffee. My biggest pet peeve is a cafe that doesn’t take the time to make iced coffee correctly. If I see you pour hot coffee in my cup with ice, I probably won’t say anything, but I’ll also cross you off my coffee shop list. As with so many things, it’s so much easier to just make it at home rather than rely on the luck of the draw to get a good cup. Recently I’ve been experimenting with adding some whole spices to the coffee as it steeps. The results are so delicious. The finished cup ends up being pretty mild due to a slow steeping process. 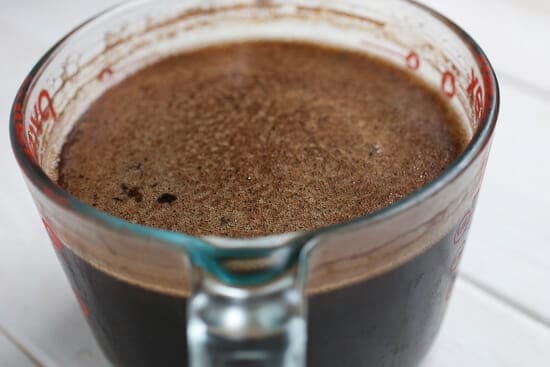 It’s great black, but you can also add a little cream or sugar to it if that’s your thing! However you like it, make a batch of it pronto! 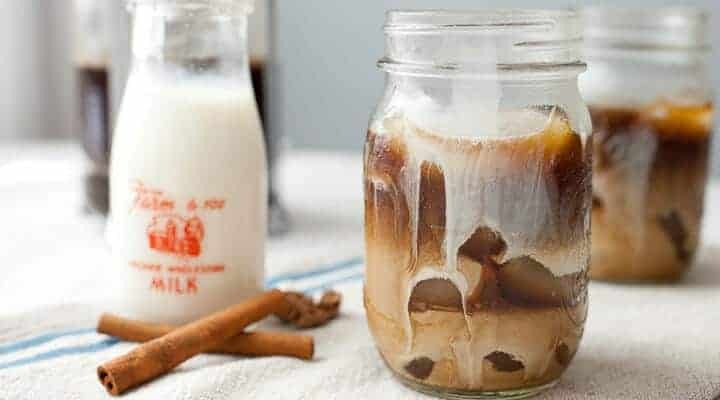 Iced spiced coffee is cold brewed with whole spices and easy to make at home. A great way to beat the summer heat! 1) Roughly grind coffee. Use a mallet to lightly smash cinnamon stick and whole nutmeg. 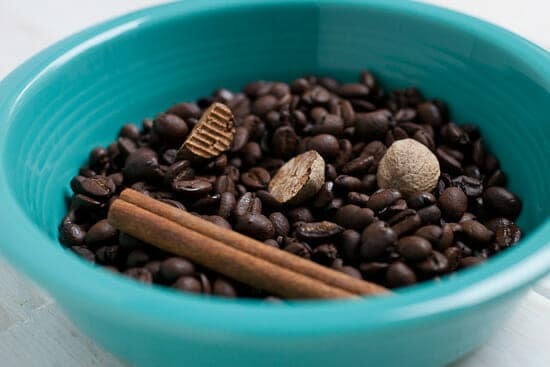 2) In a large container, add coffee and spices and room temperature or slightly warm water. Stir together and Let steep for at least 4 hours or ideally overnight. 3) Strain coffee using a french press or letting it drain through a filter. 4) Pour coffee over ice and add some sweetener and/or cream or milk if you want. It’s great black also though! The key to making sure the coffee isn’t over-powered by the spices is to use whole spices. If you’re a nutmeg fan, you can toss in all those halves of nutmeg that you have from grating it in things. Again, it’s seriously worth buying whole spices just for this. It’ll cost you a few bucks for a big thing of cinnamon and nutmeg. If you would like to defy me and use ground spices, use a very small amount. Just a pinch would have the same effect, but I think it would probably still be a bit too much because you wouldn’t be able to filter out the ground spices. 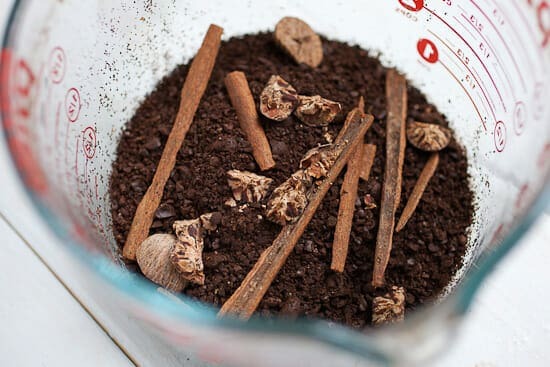 With whole spices though, grind up the coffee and roughly smash the cinnamon and nutmeg. I just use a kitchen mallet and give them a whack! Add four cups of water to the mix. Use room temperature or slightly warm water and stir it all together. If you use hot water, it’ll become a bit bitter from the spices. Using cold water and time will result in a super-smooth cup. This will need to steep for at least four hours so it’s not a spur-of-the-moment thing, for sure. The best way to handle it is just to make a batch and let it sit overnight in the fridge. Then you can use a french press to strain the coffee or just pour it through a normal coffee filter. Like I said, it’s totally refreshing without anything else, but I do like a little milk in mine. Personally, I recommend making a double batch of the stuff and keeping it in the fridge for the week! Then you can avoid the iced coffee lottery all together! I LOVE black iced coffee & the spices are a fabulous addition. Coffee doesn’t love me as much these days, but I still treat myself to the occasional cup! Have you tried cardamom or vanilla? Hey Felicity! I haven’t but I worry that vanilla might be too strong. A full vanilla bean can pack some punch and unless you REALLy like vanilla it might be overpowering. A cardamom pod on the other hand would work just great I think! Good luck! Making this tonight!!! So hot here is South Florida, this is just what I need!! I do like this recipe because of the spices, and to make it mocha, use Hershey’s dark syrup around the inside of the glass, yum! Oh man, I can’t wait to do this with my usual cold-brew coffee method. I have a feeling you have pretty much changed my life. Ha! Hopefully your coffee life at least. :) Report back! Nick, This is fabulous! I made this last night and am enjoying it immensely this morning. Thank you! I also took your advice and made a double batch to last me all week. LOVE it, so yummy!!! Awesome Jenny! Glad you tried it out and liked it! 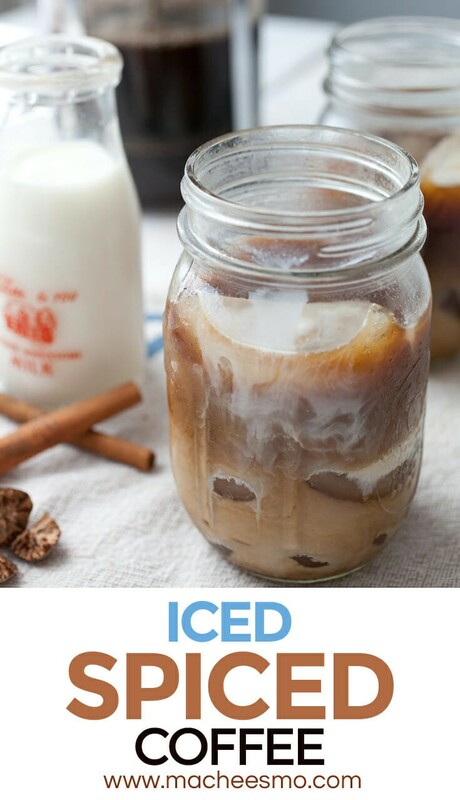 I too love a good iced coffee and after seeing this post think its about time I made one. Looks divine! Nick, can’t wait to try the spiced ice coffee! Perfect for the summer temps we’re *finally* having! I’m trying this tonight with French roast and my own blend of spice: cinnamon, nutmeg, clive and cayenne. Will report in the morning after I press, pour, get my half & half and a lil squirt of liquid stevia on. I can’t wait!!! Oh goodness…I need to make a GALLON of this! We just started hitting triple digits in Las Vegas and this is the perfect remedy!!! It’s just the kick I need to get going when it’s already 80 degrees at 7am!!! Delicious!! The spices are subtle, but definitely present. 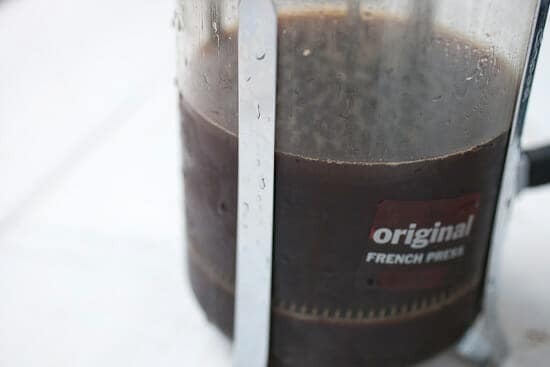 This recipe took my cold brew game to the next level. I strain mine using cheesecloth over a mesh sieve. I wash out the cheesecloth and reuse the same piece each week to make a new batch of cold brew. Make coffee ice cubes. Then, your iced coffee can be good to the last drop.